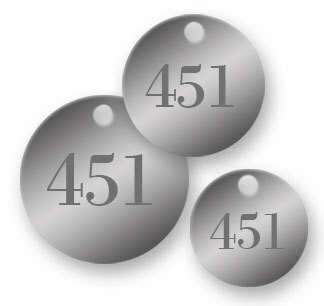 Engraved Stainless Steel Tags are Extra Durable, Indoors or Outdoors! 316 Grade Stainless Steel can withstand harsh elements found outside in any climate, or even commercial or industrial uses where chemicals and other abrasives are present. They are corrosion-resistant and last for years in nearly any application. Perfect for valve tags, asset tags, equipment tags or any ID tag that is exposed to harsh environments. Nap Tags' stainless steel tags are engraved with a laser which darkens a permanent image that won't fade or deteriorate over time. Pin-point laser engraving technology creates clear, easy-to-read text and graphics for greater detail than traditional rotary engraving. And it will last longer too!